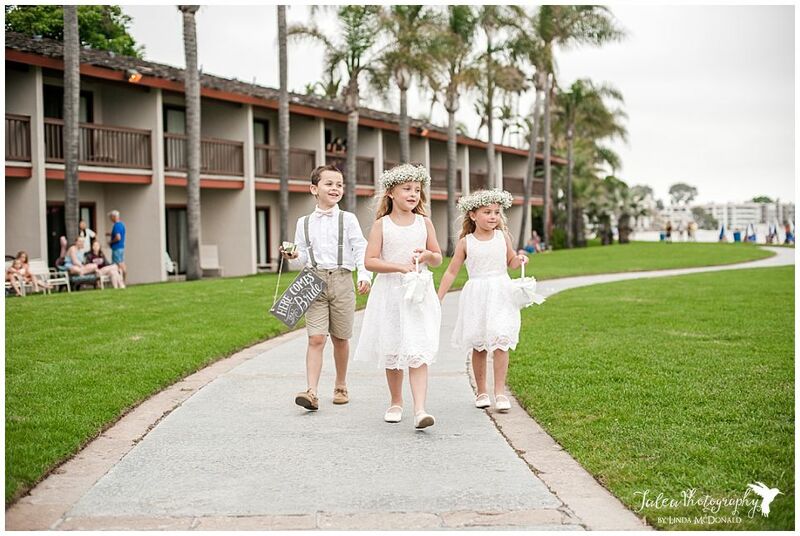 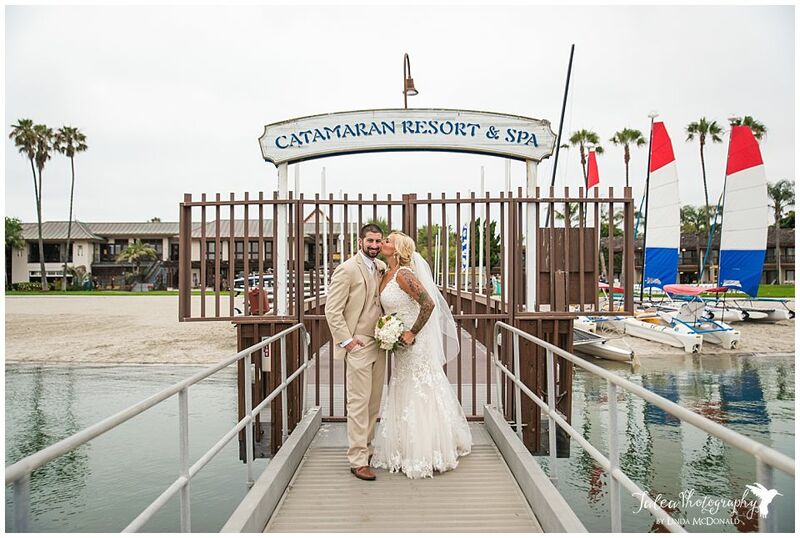 If you're considering a beach wedding or you're into a Polynesian theme, the Catamaran Resort and Spa in San Diego might be your place! 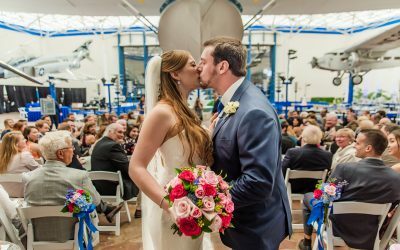 As a wedding photographer, one of the things I consider when evaluating a venue is if it has a variety of good spots for photo ops. 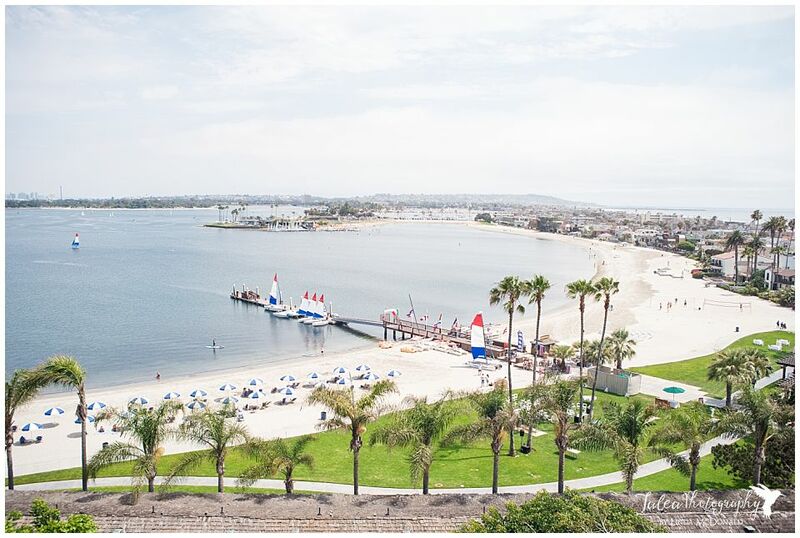 From the garden area with its exotic plants, waterfalls, koi ponds and tropical birds to the bay which is just a few feet away, the resort did not disappoint. 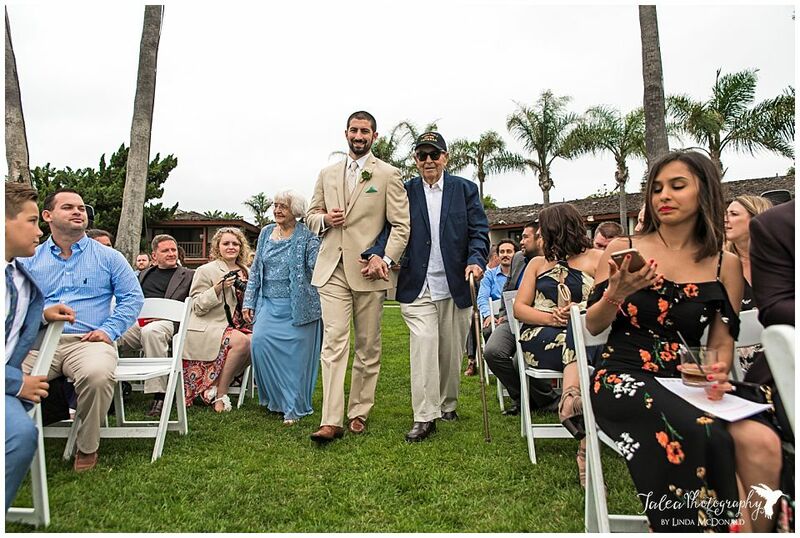 Also, there's plenty of shade for when you're photographing in the harsh mid-day sun. 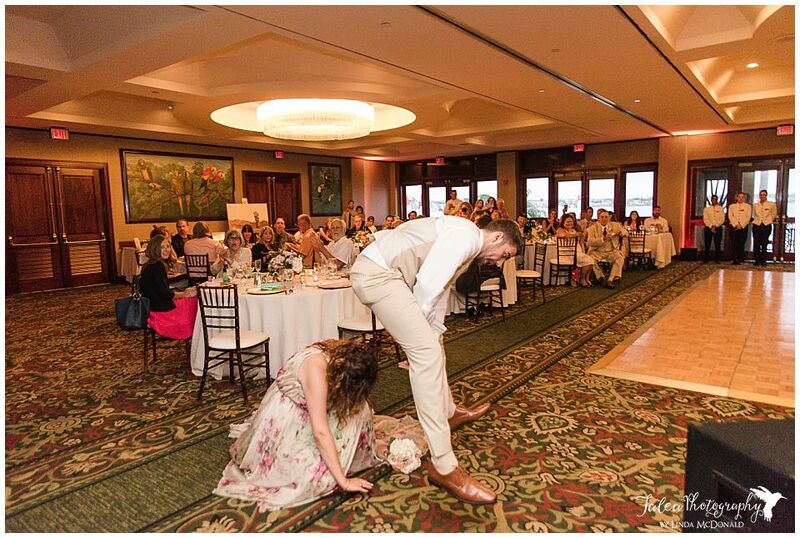 Another thing I consider is if the staff is helpful and accommodating. 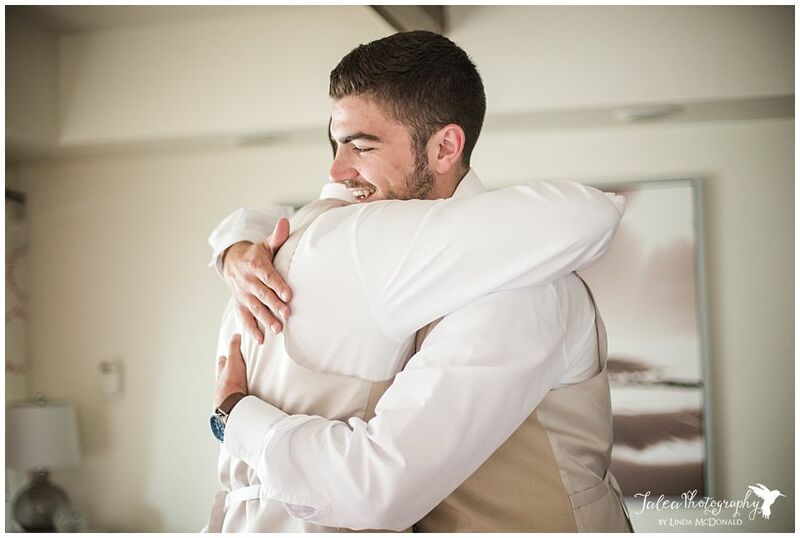 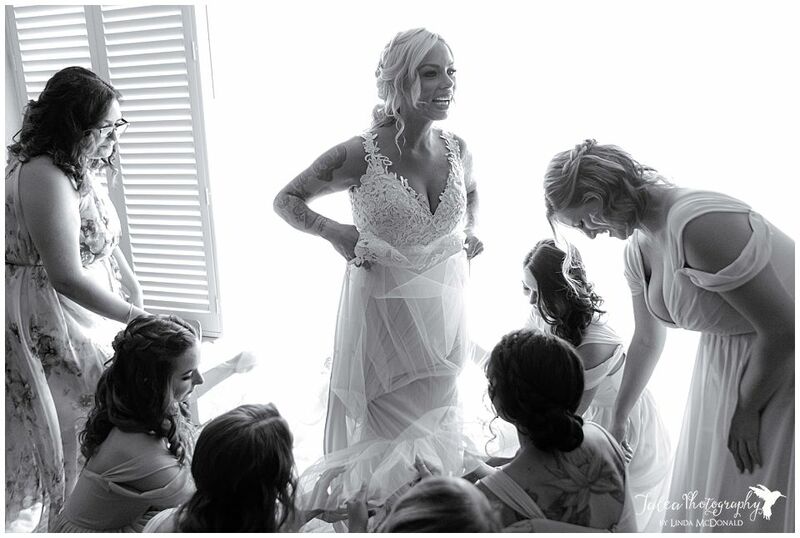 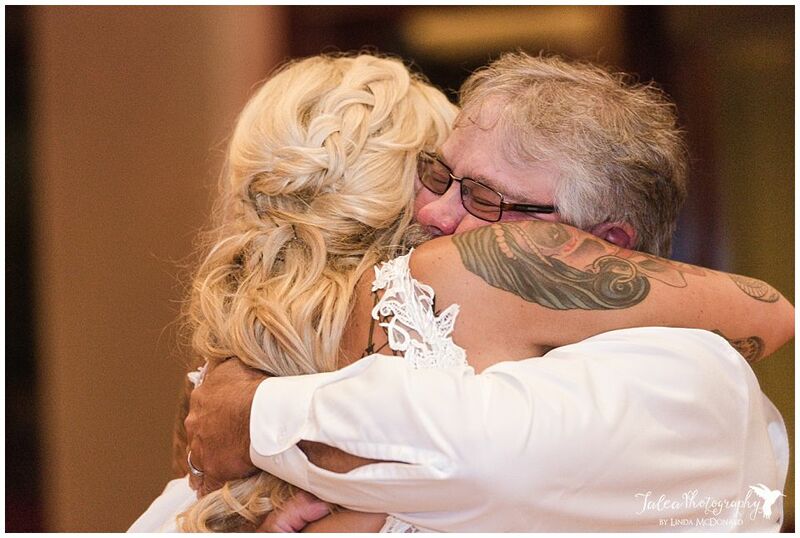 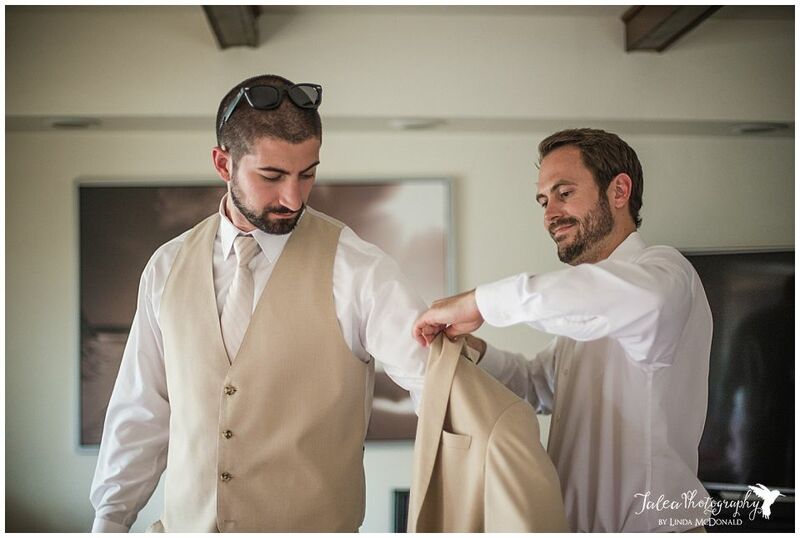 This is SO important for making your wedding day run smoothly. 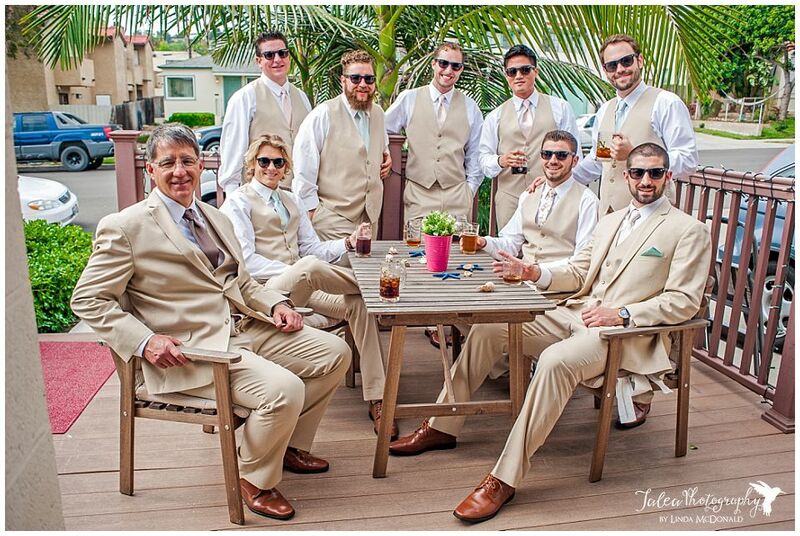 Well, they didn't disappoint in this area either. 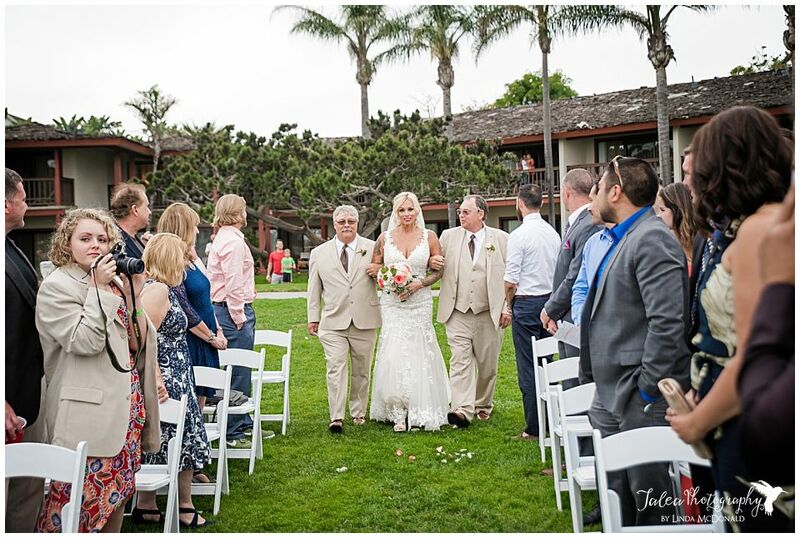 The resort staff was friendly and the catering and wait staff treated vendors like they were guest. 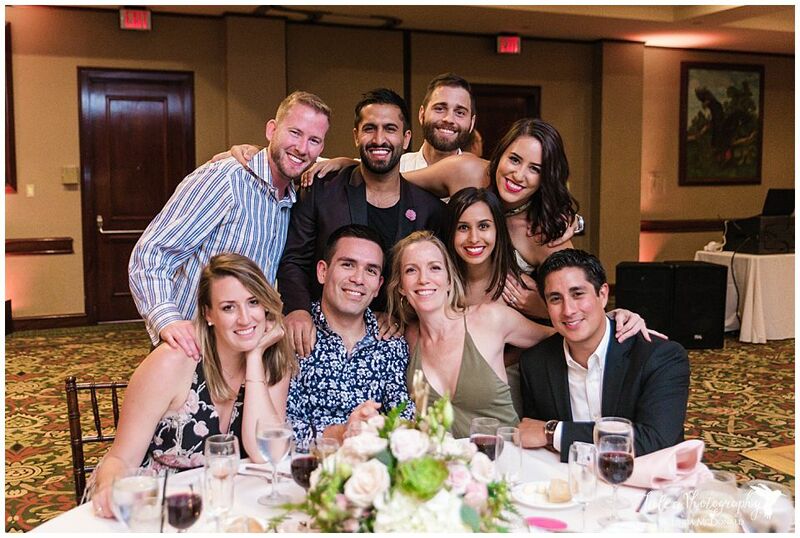 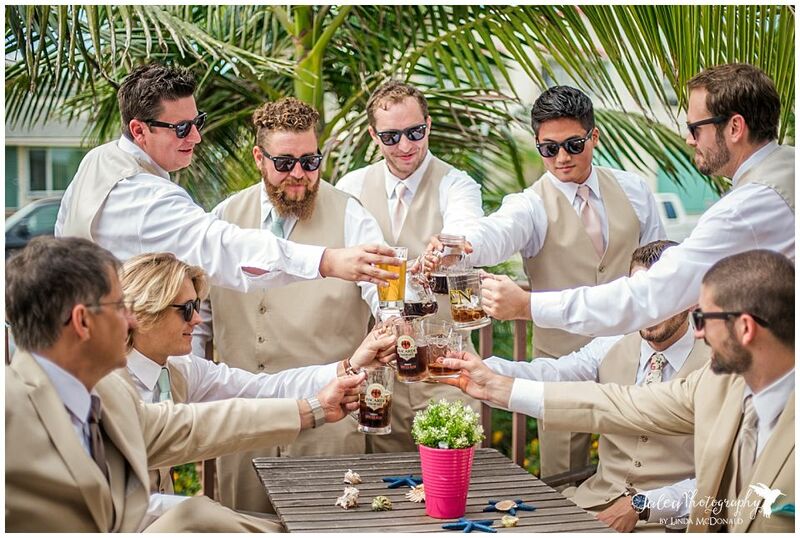 I have no doubt they treated the wedding guest well too. 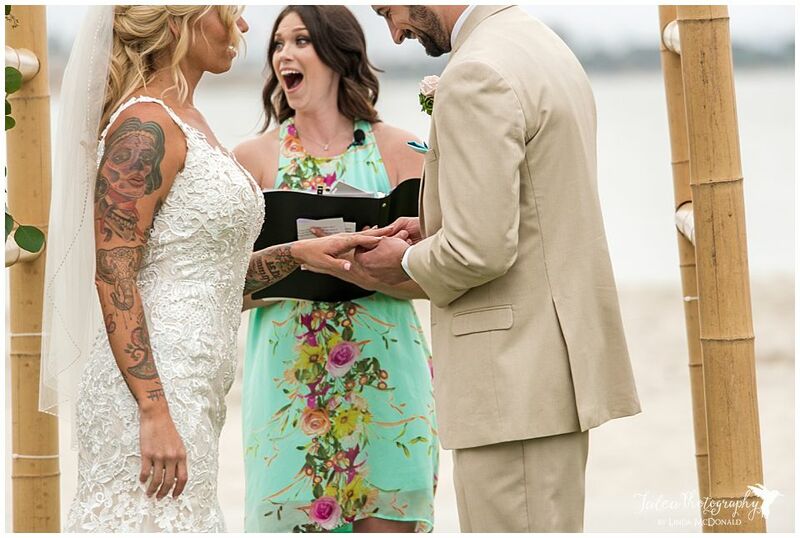 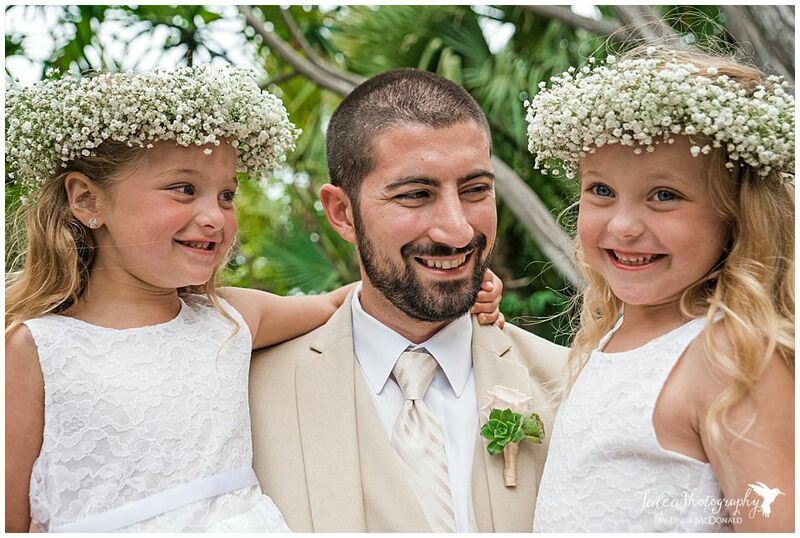 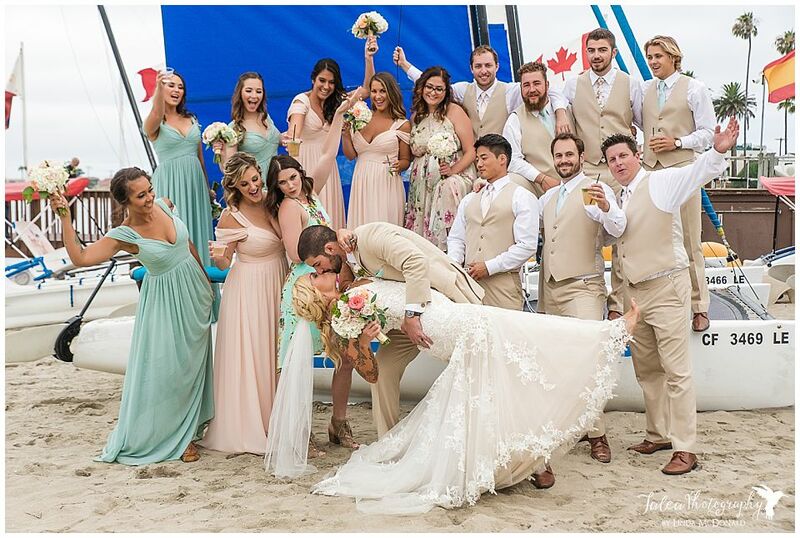 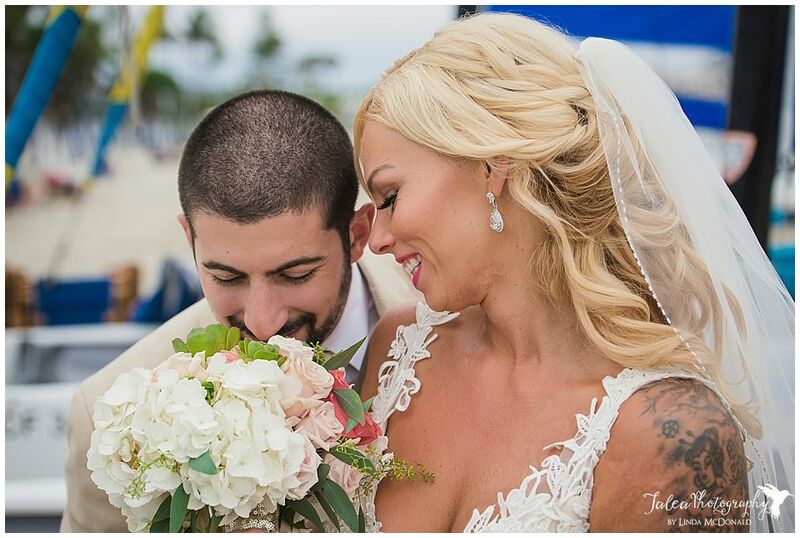 It was a beautiful June day for a beachfront wedding. 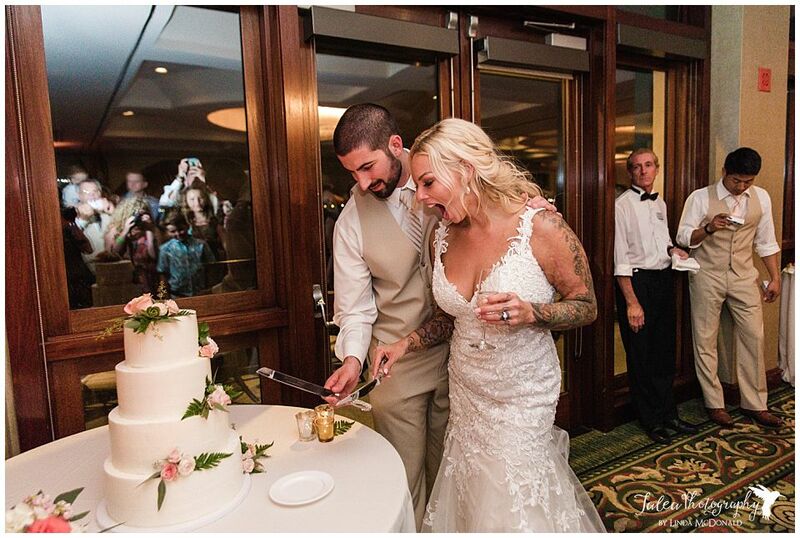 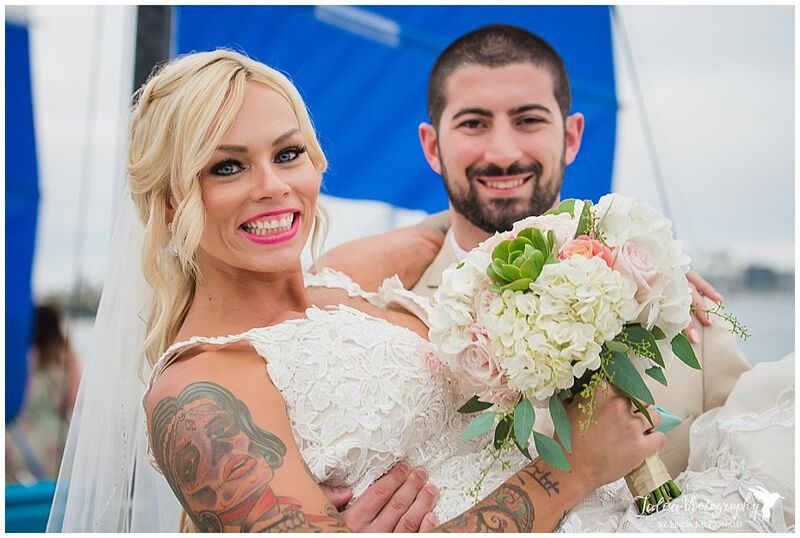 Crystal and Dan are a fun-loving couple and it shows in all their photos. 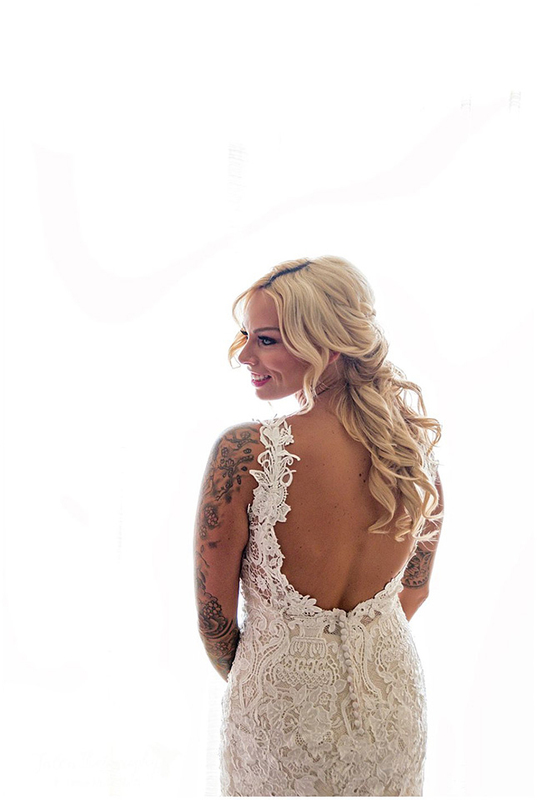 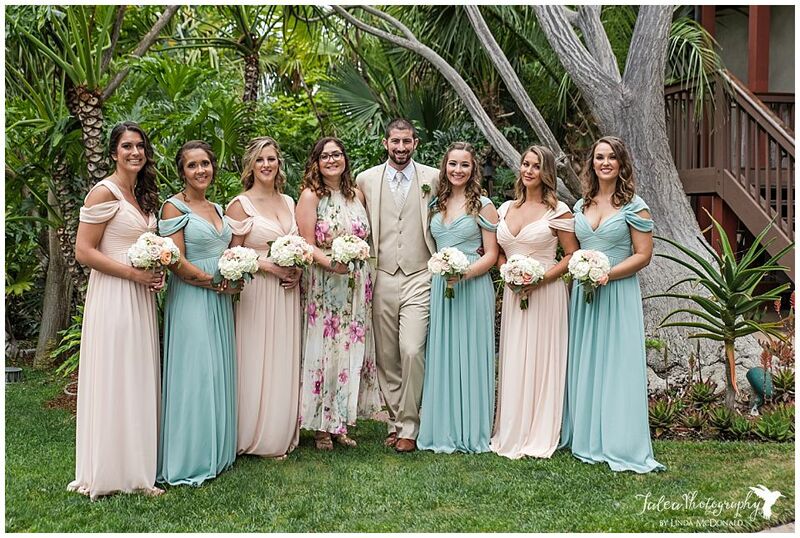 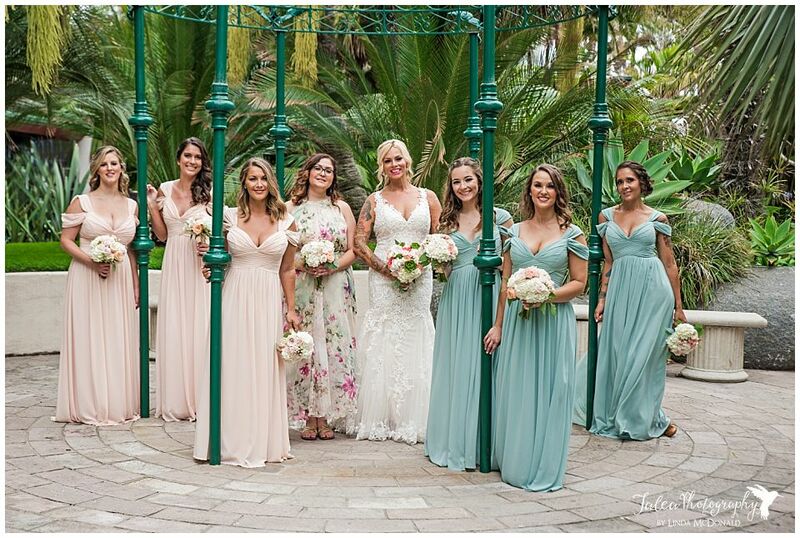 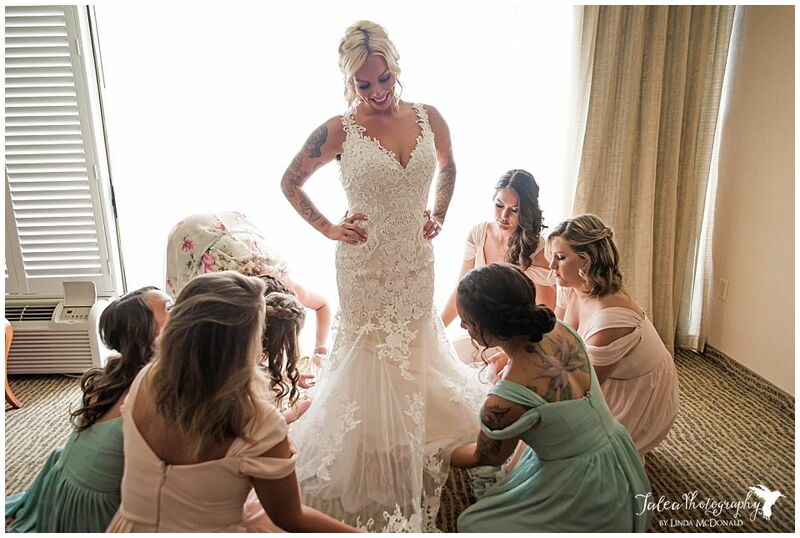 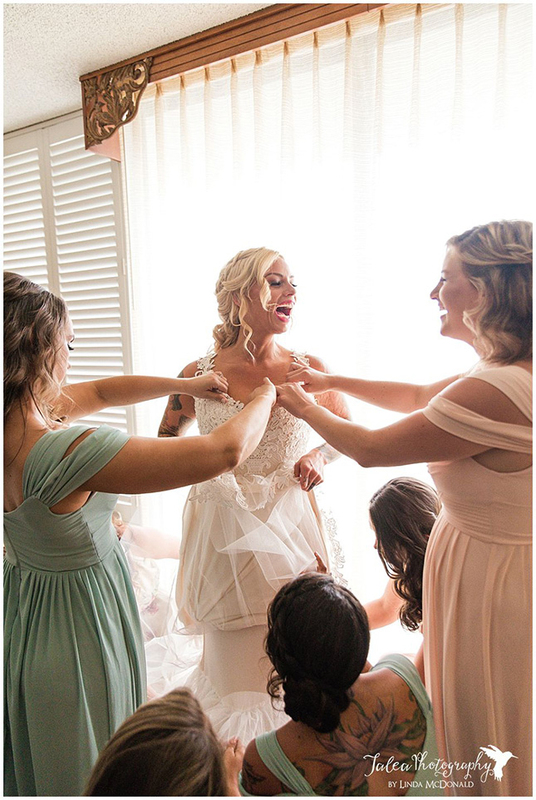 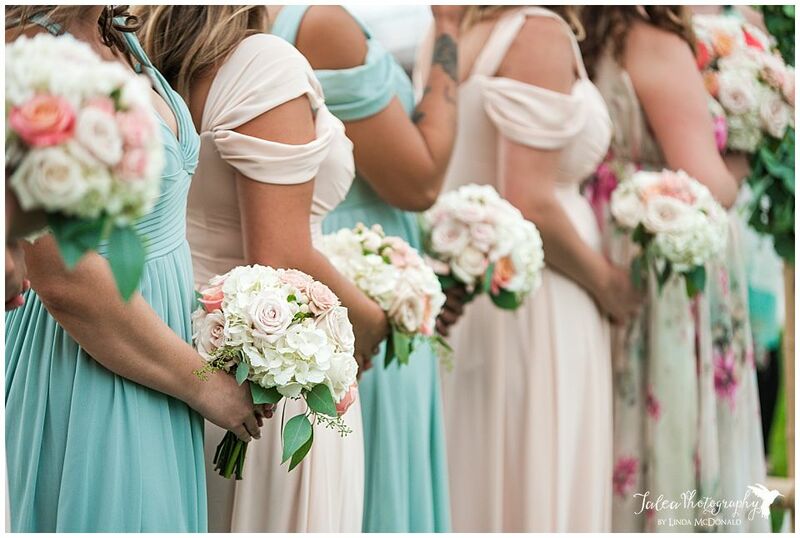 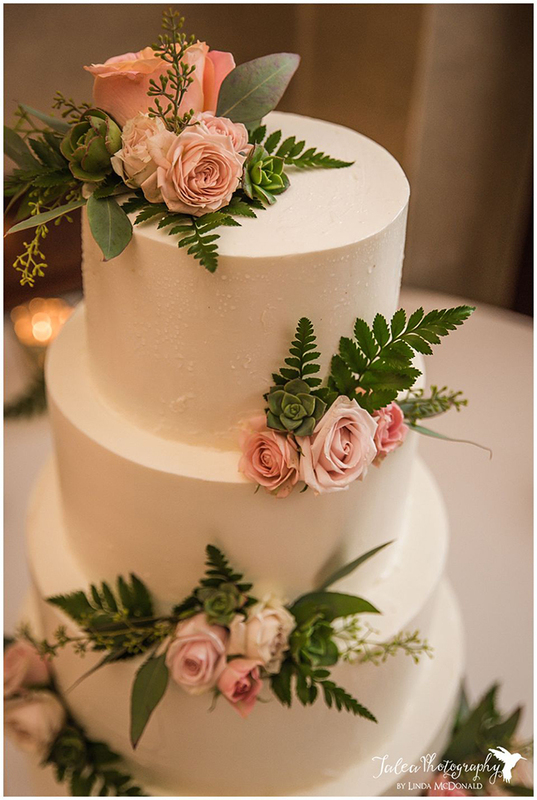 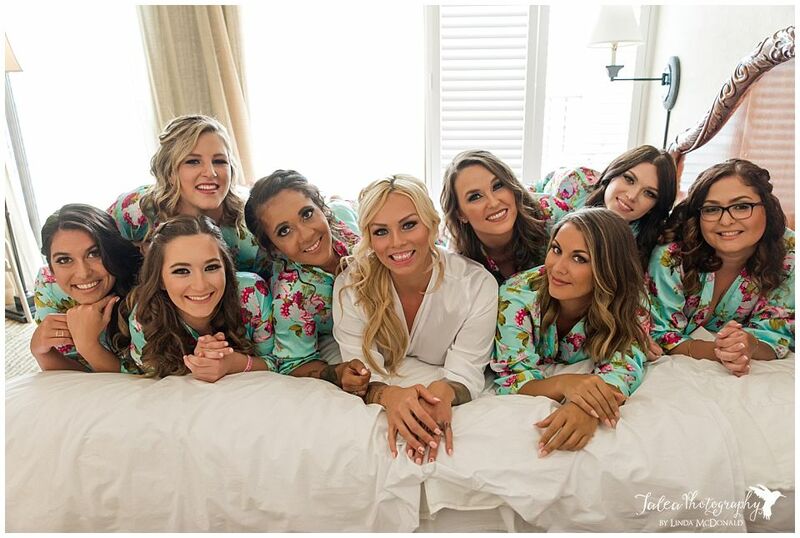 Crystal chose mint green and blush pink for her wedding colors. 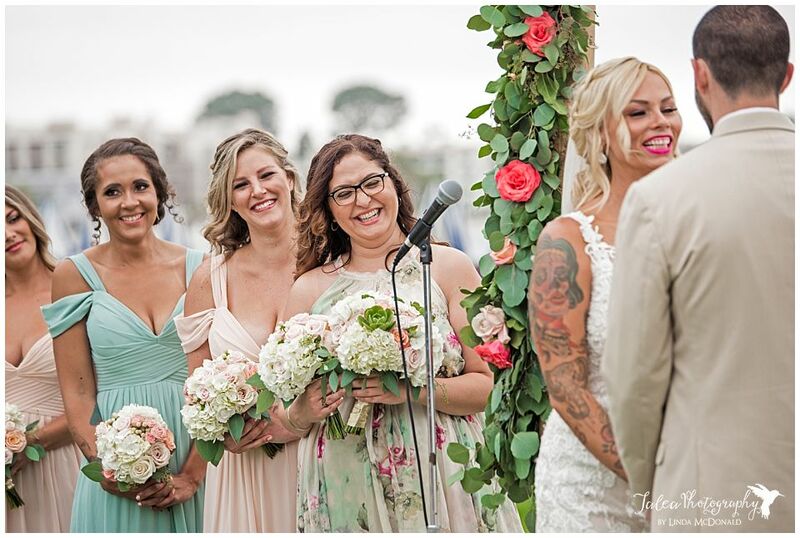 Her bouquet was made up of roses in matching colors and succulents. 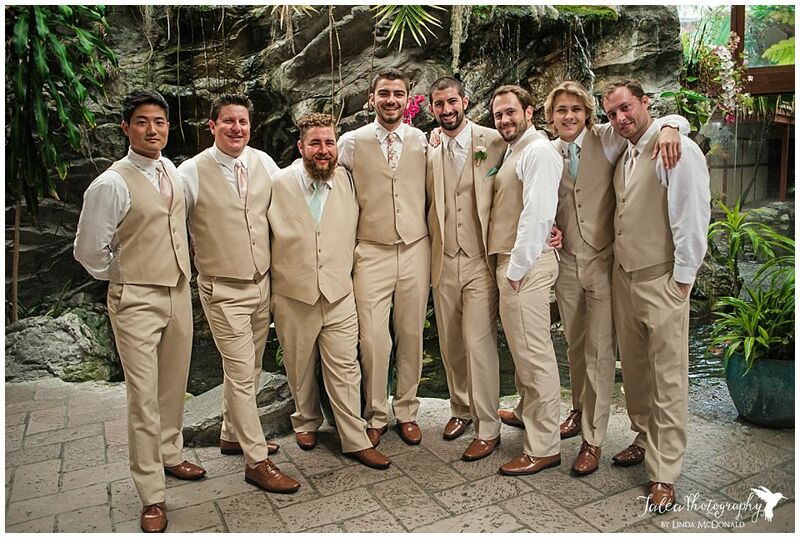 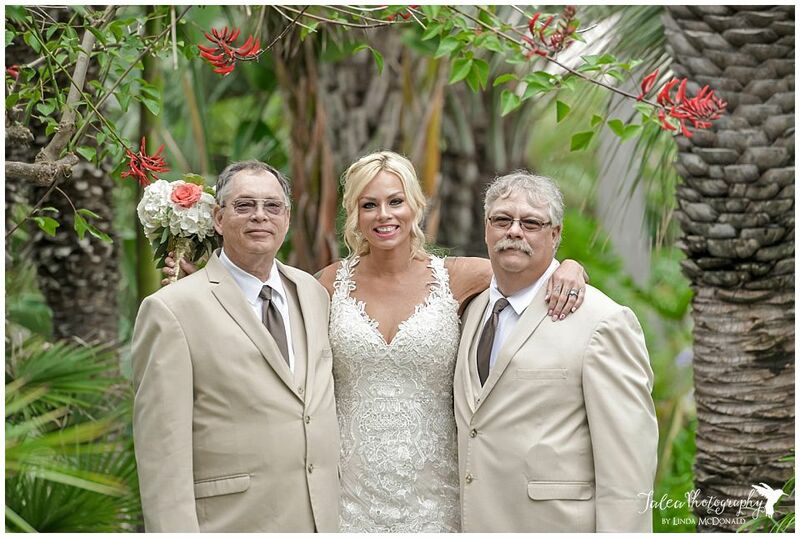 The groom and groomsmen were dressed in matching beige suits. 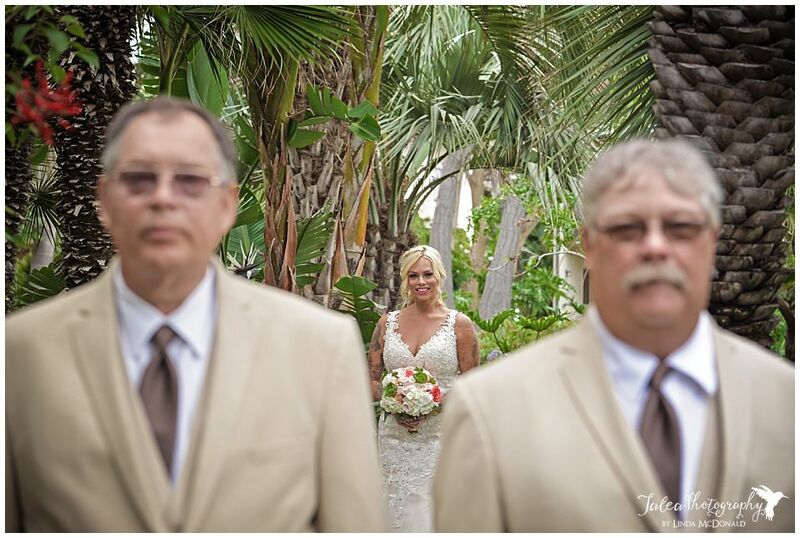 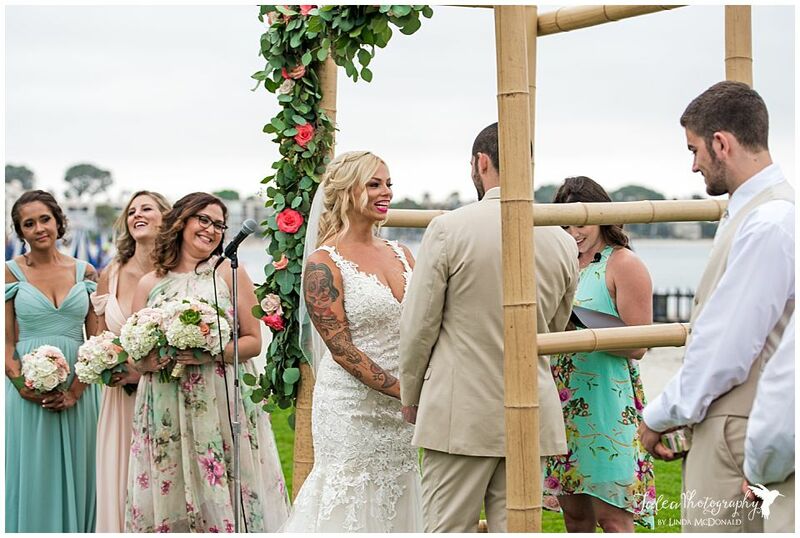 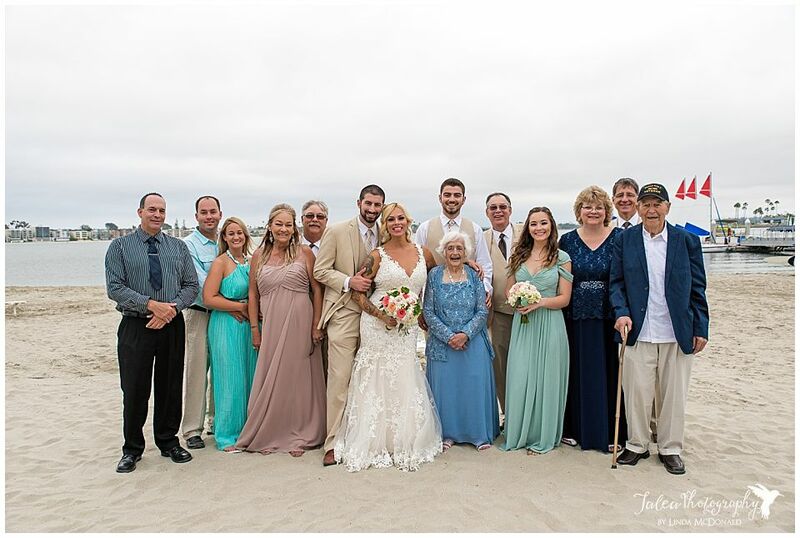 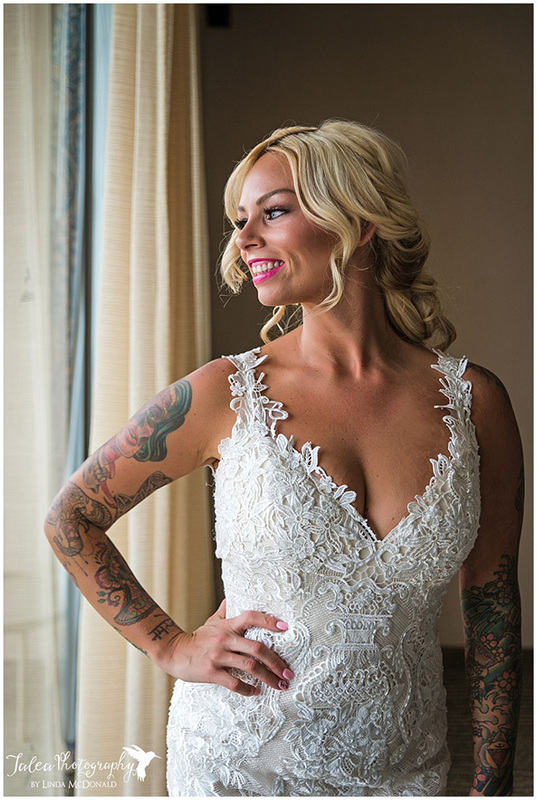 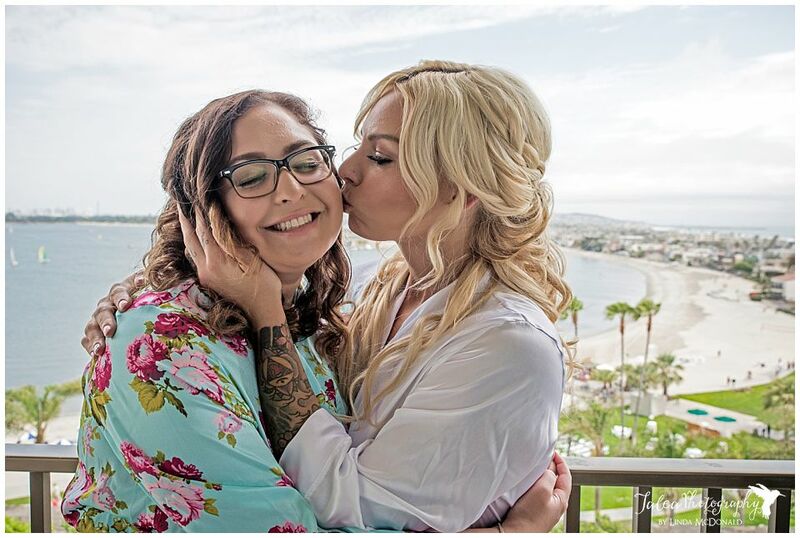 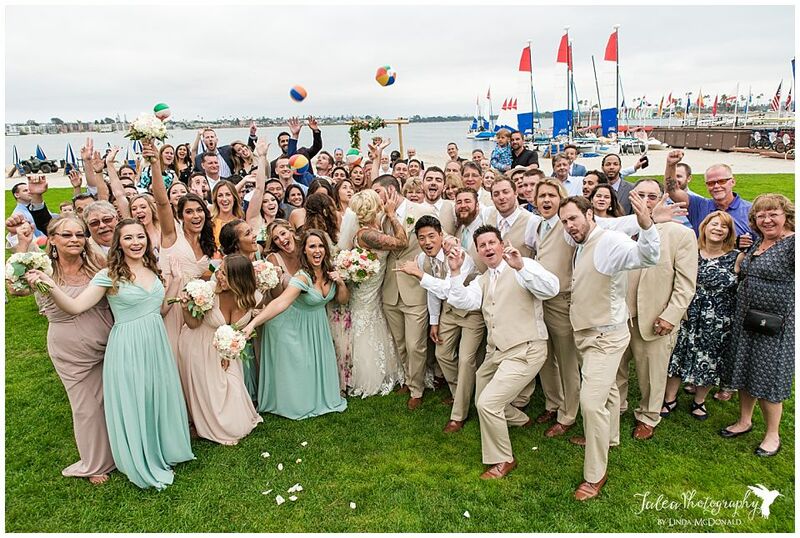 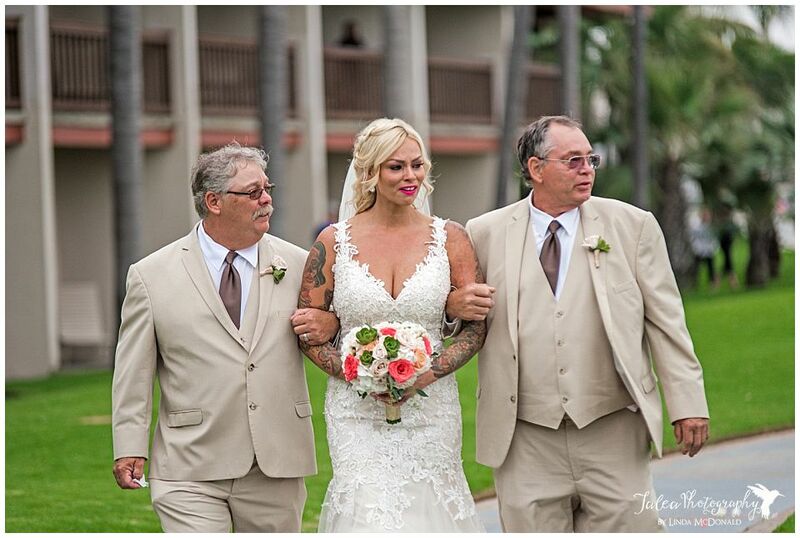 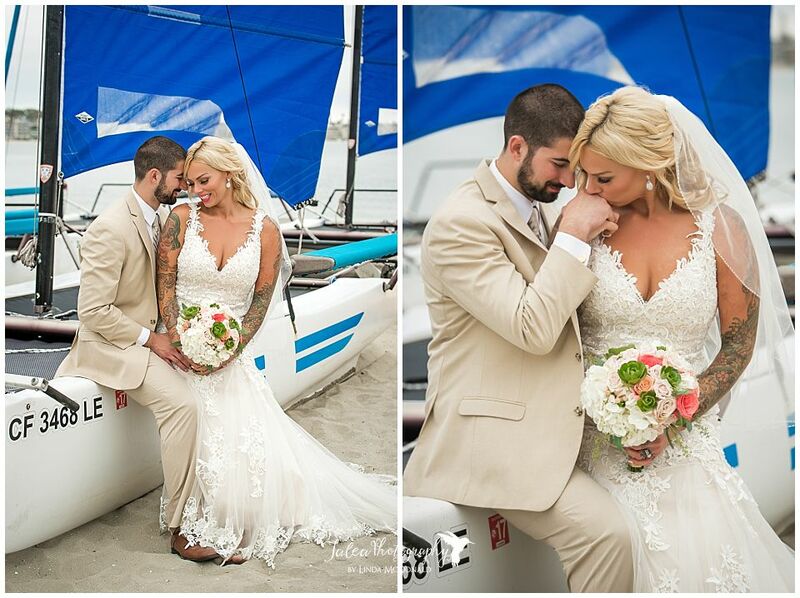 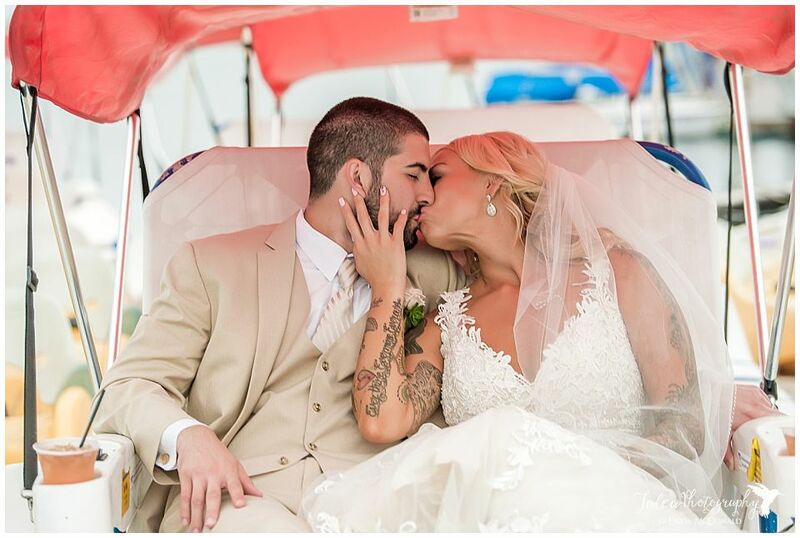 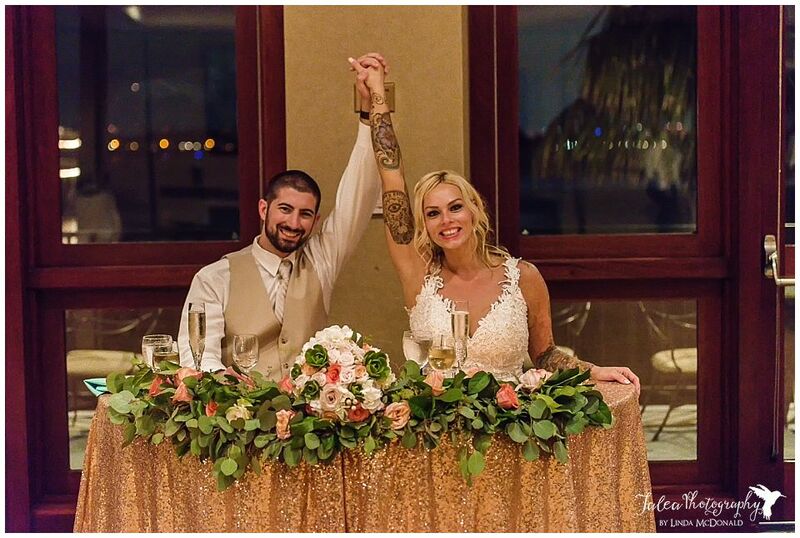 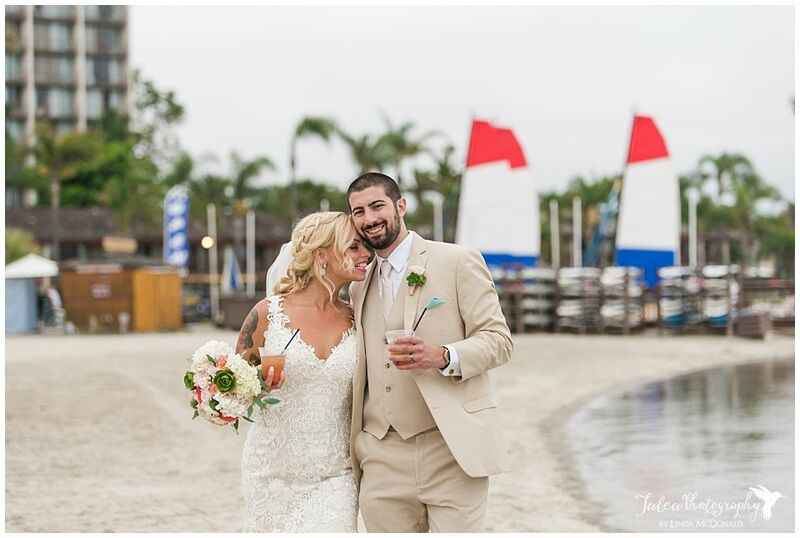 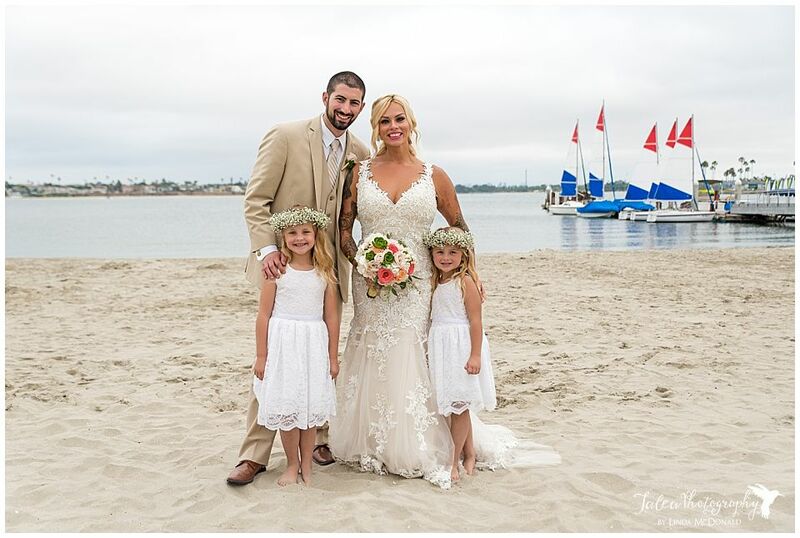 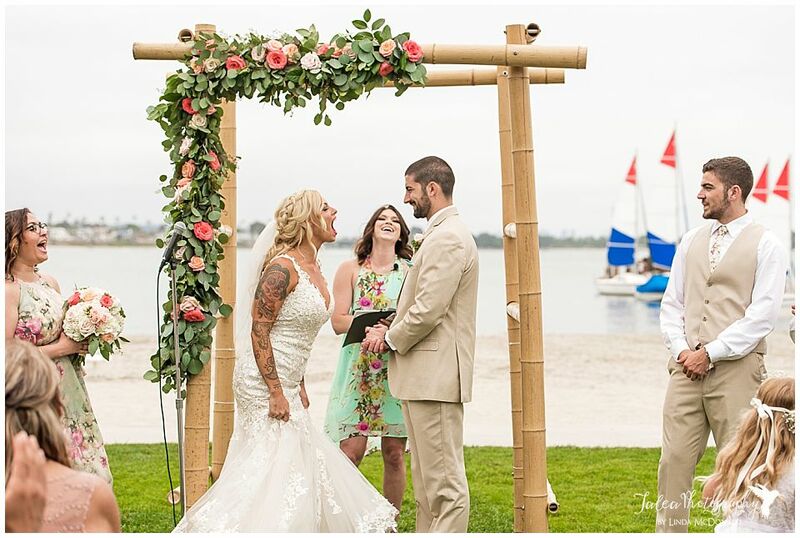 The couple got married in front of Mission Bay with a beautiful backdrop of sailboats and palm trees, surrounded by their closest family and friends. 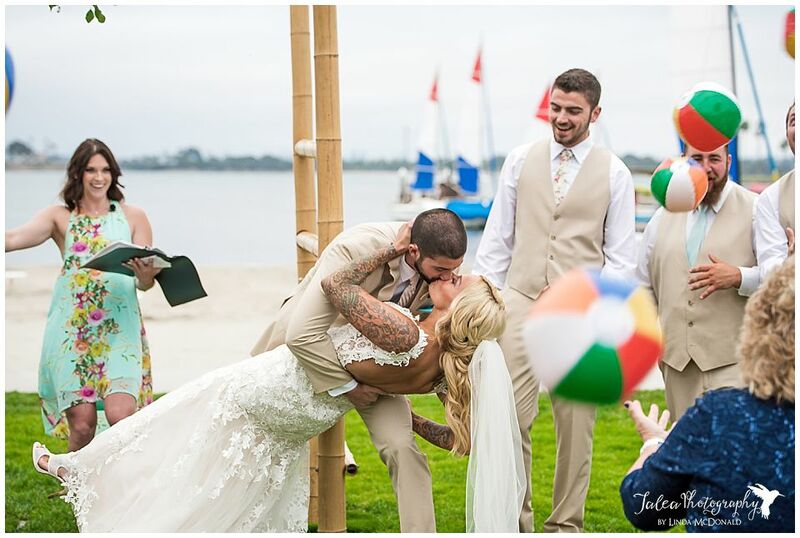 My favorite part is the first kiss, where Dan dips Crystal and beach balls are flying everywhere. 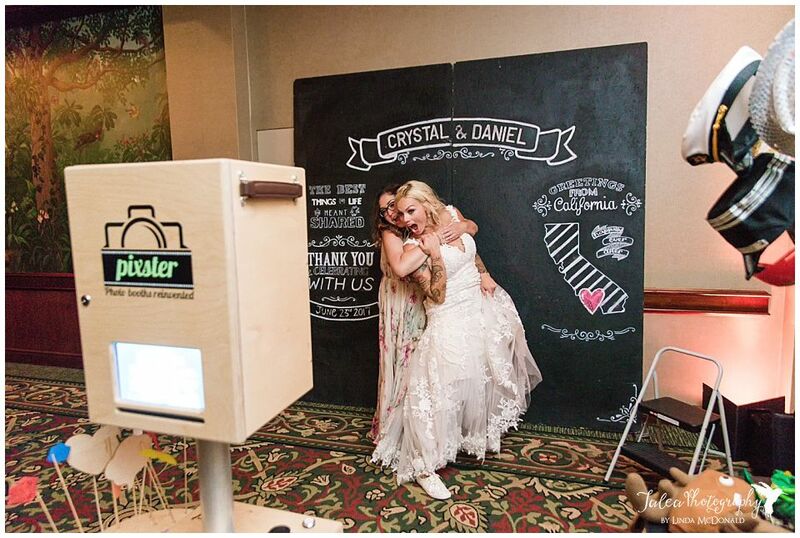 Best photo prop ever!! 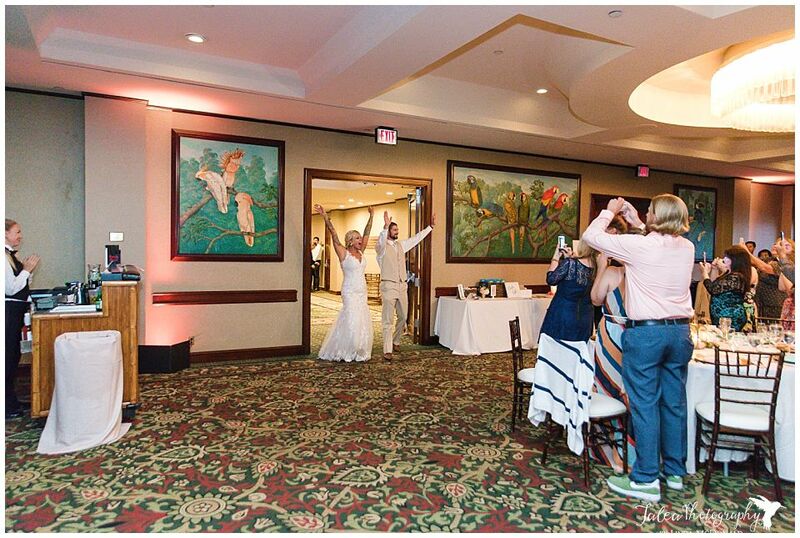 The reception was held in the Catamaran’s Aviary Ballroom. 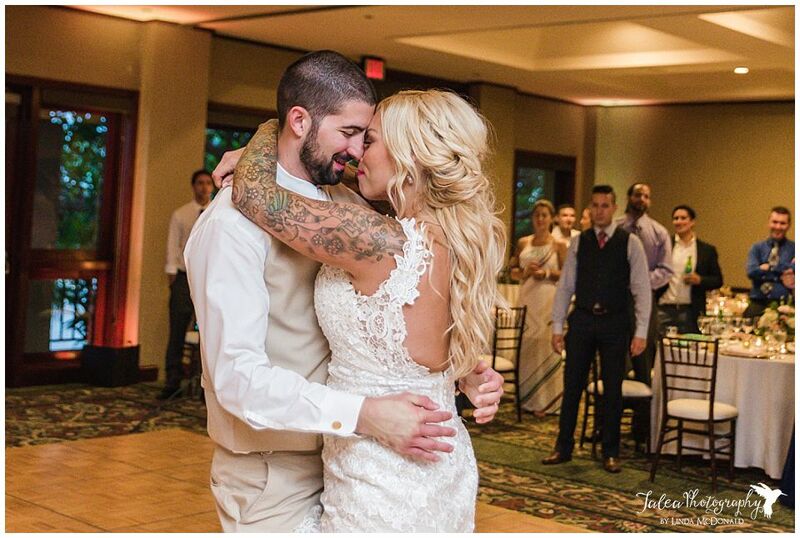 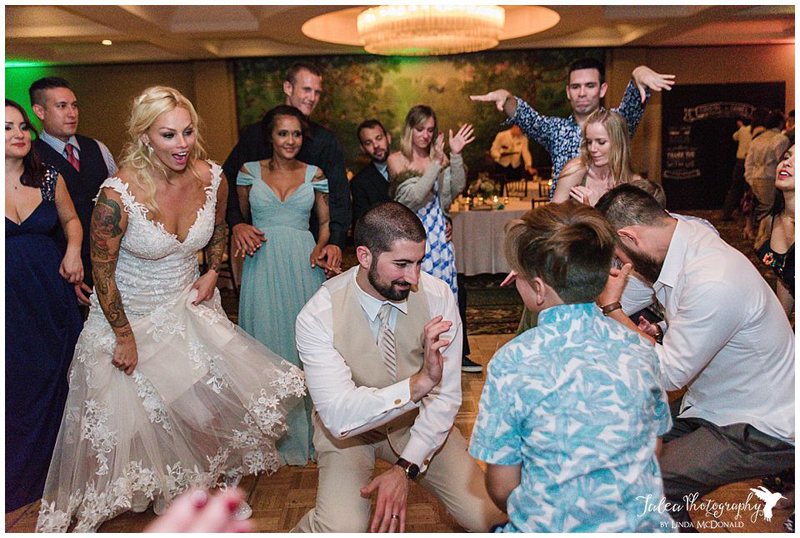 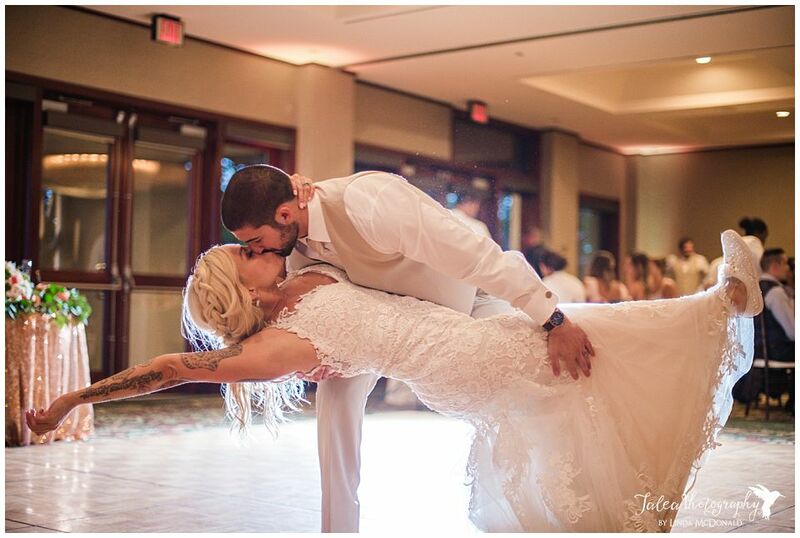 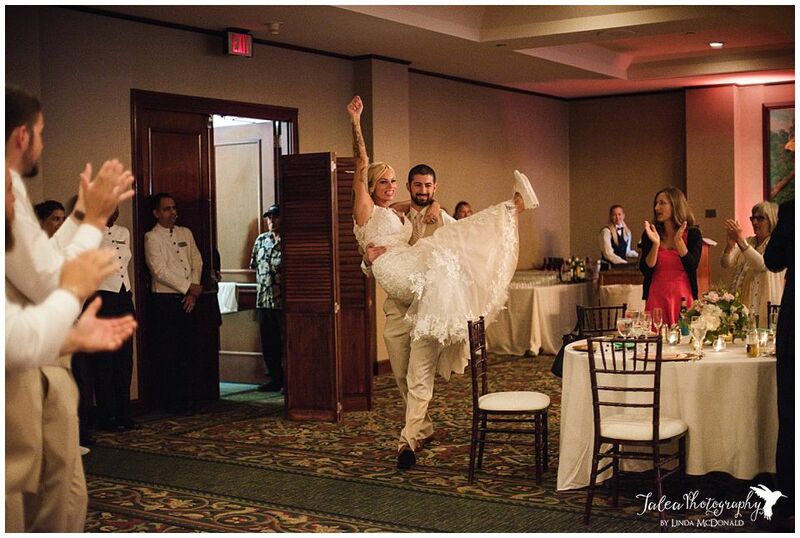 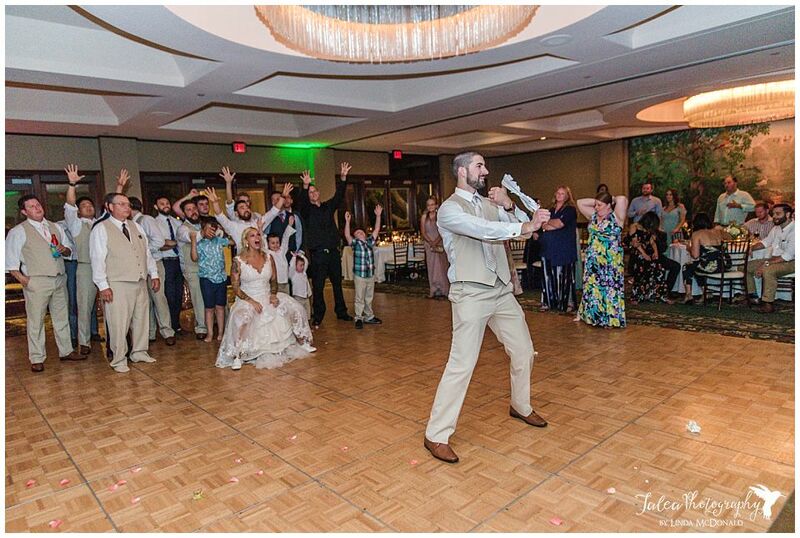 The bride and groom are huge country music fans. 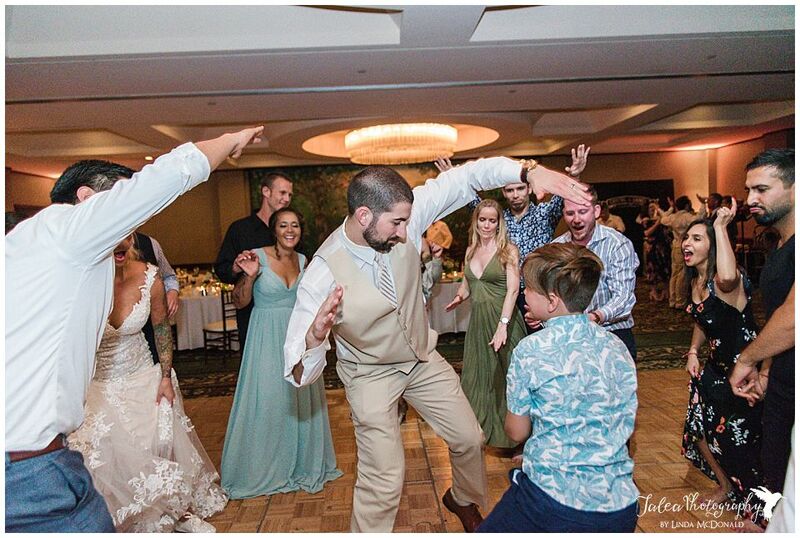 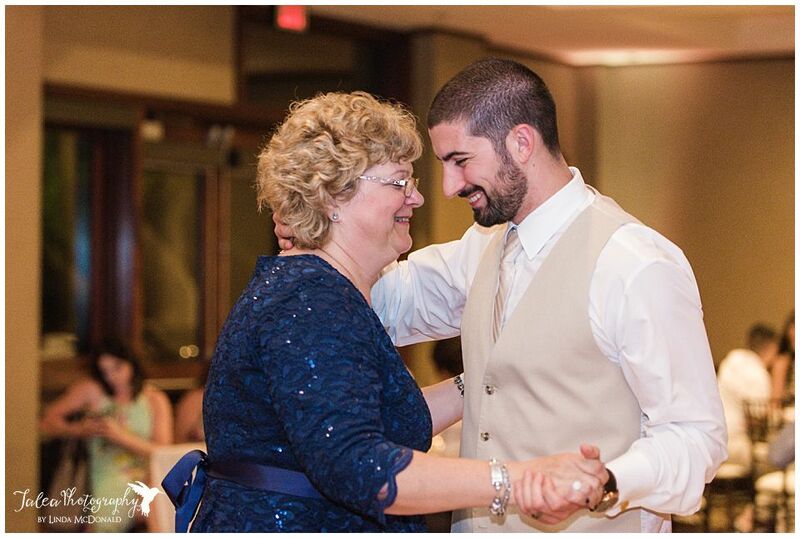 So there was no shortage of county music played as they finally got a chance to cut loose on the dance floor. 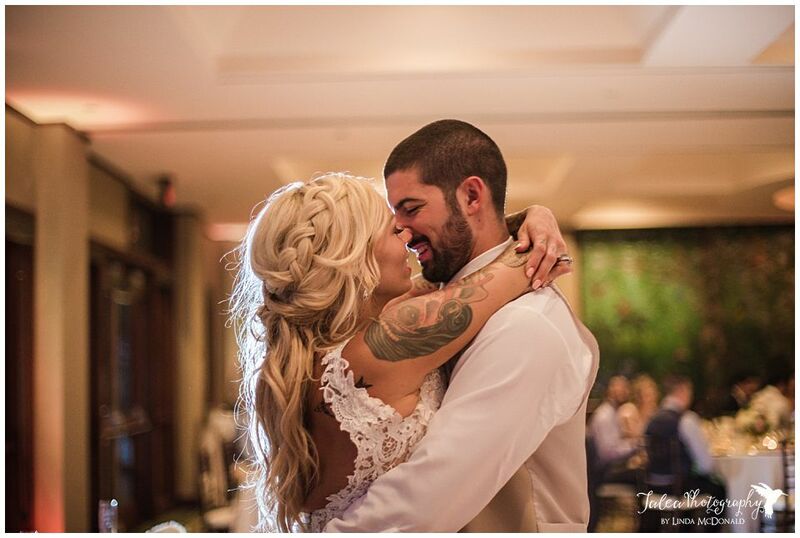 The day was filled with lots of love and many beautiful moments. 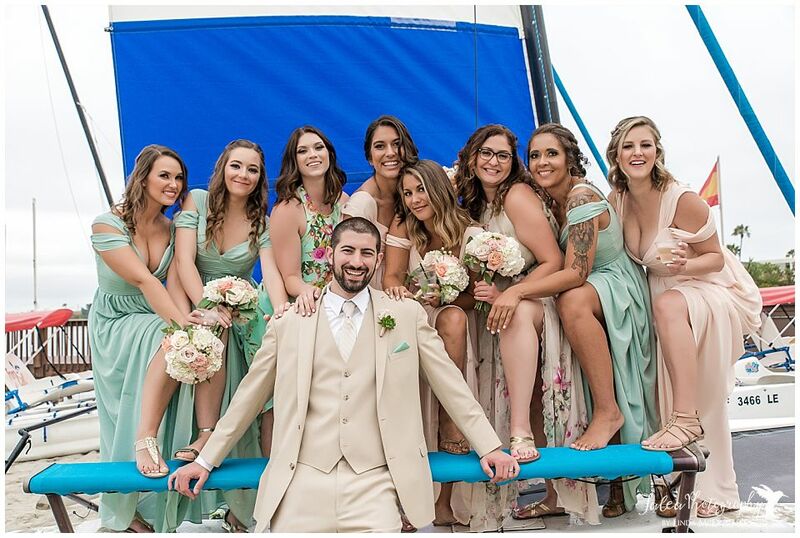 Crystal and Dan, I wish you many years of joy and happiness! 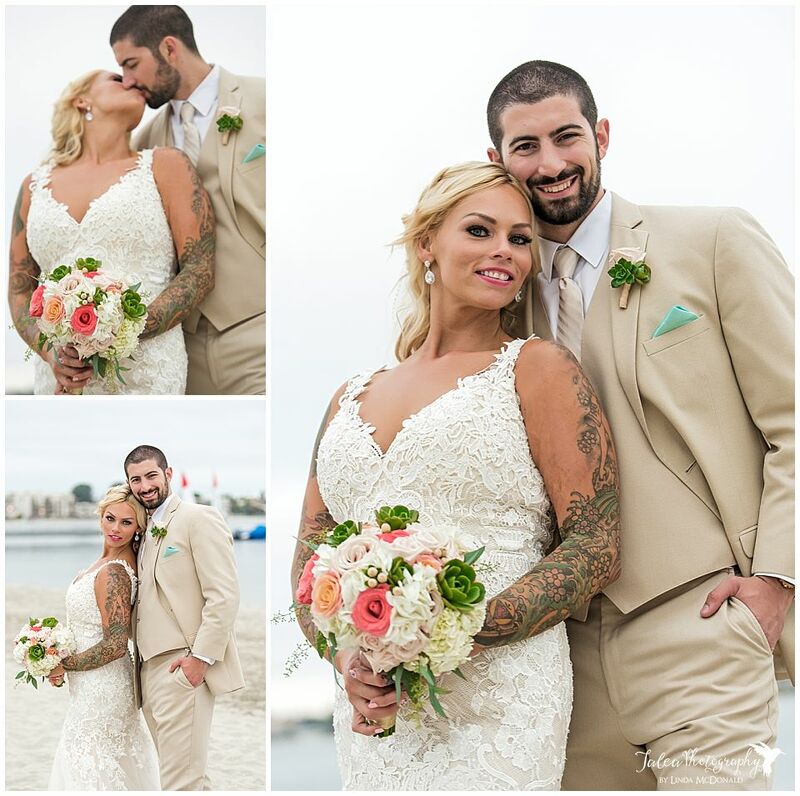 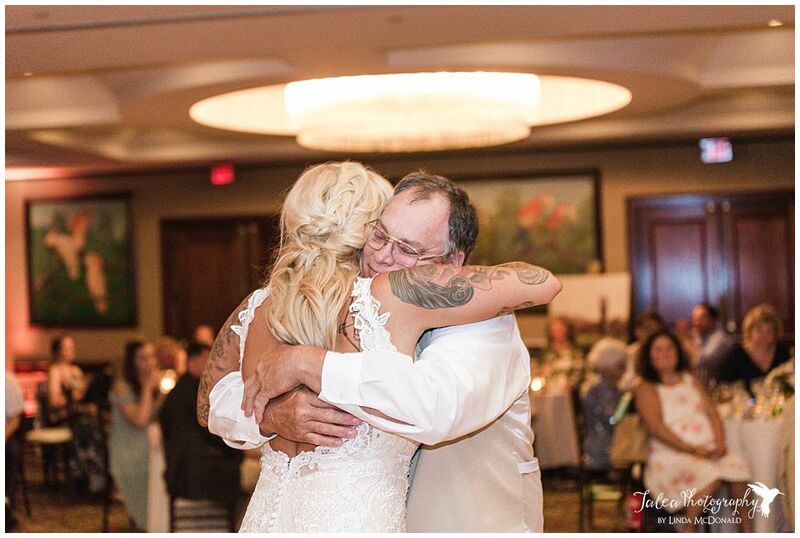 Here's some highlights from their big day! 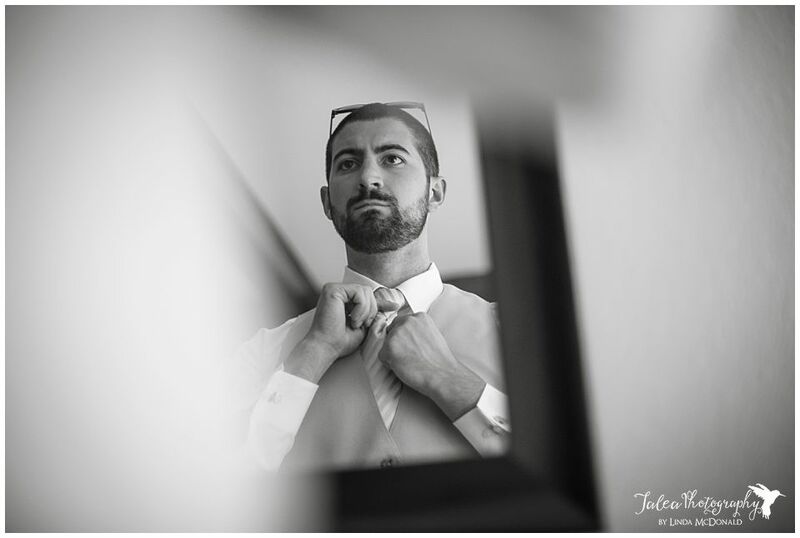 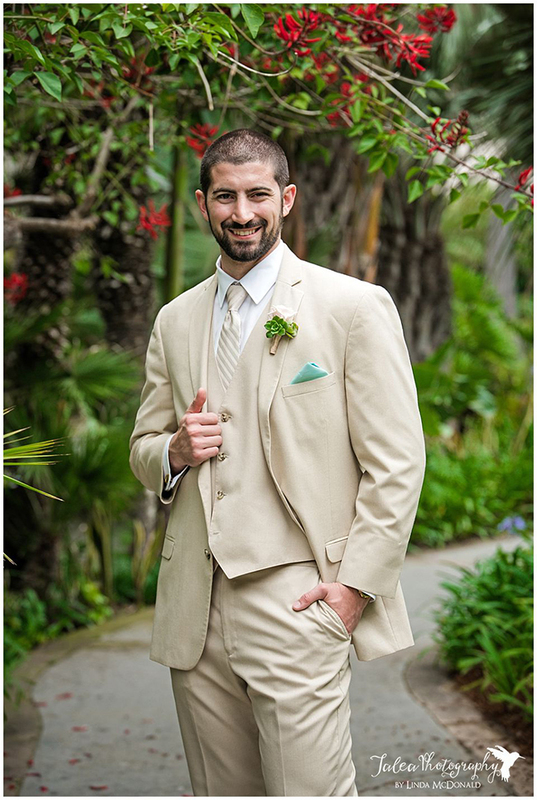 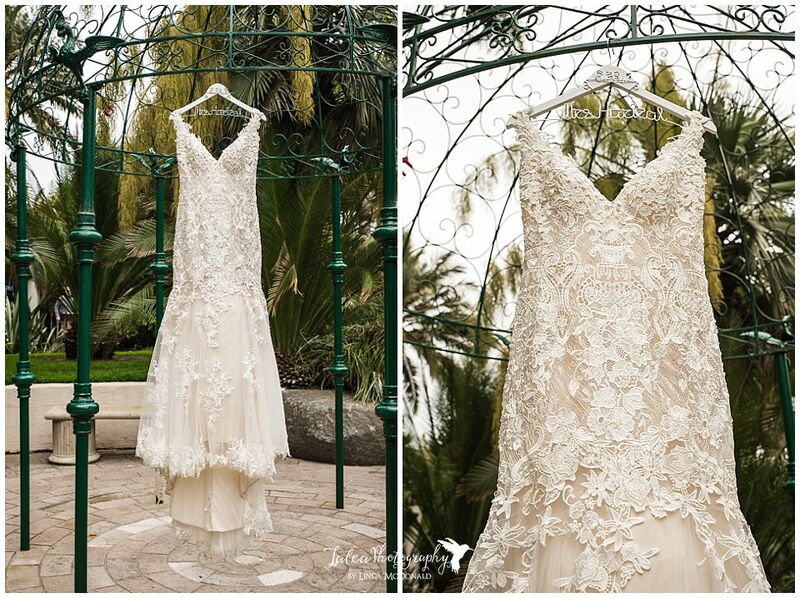 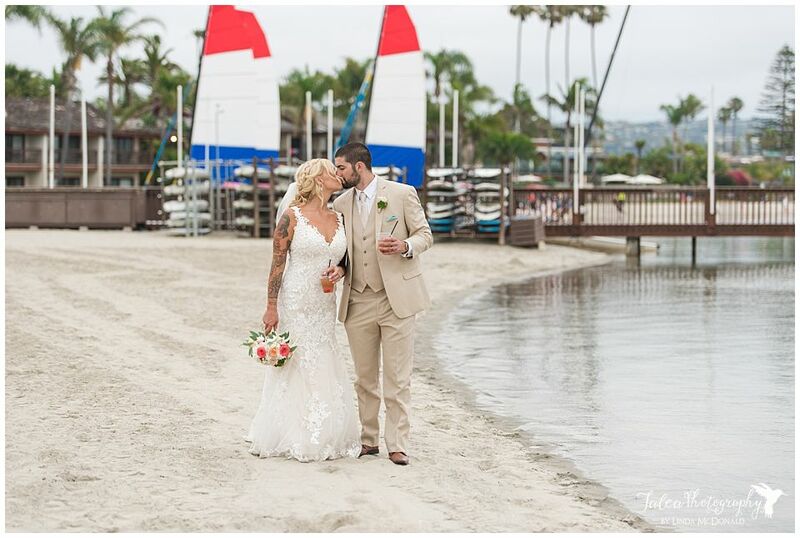 If you're getting married and looking for a wedding photographer in San Diego, I'd love for you to get in touch! 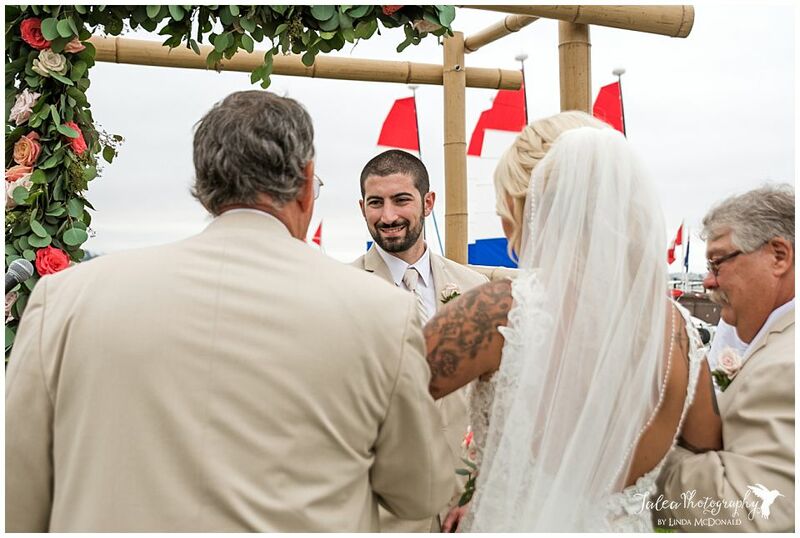 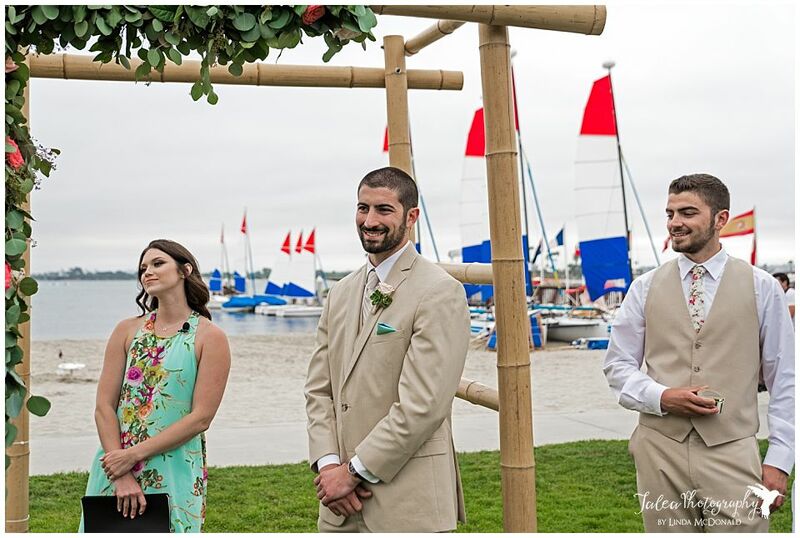 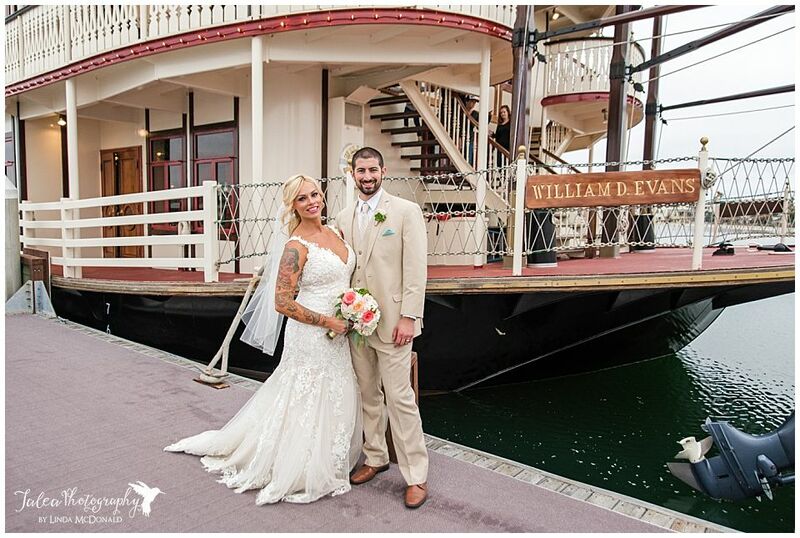 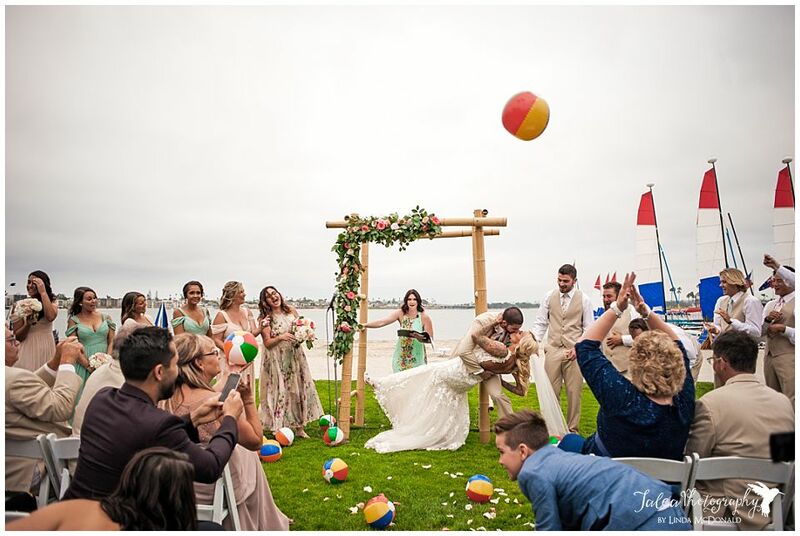 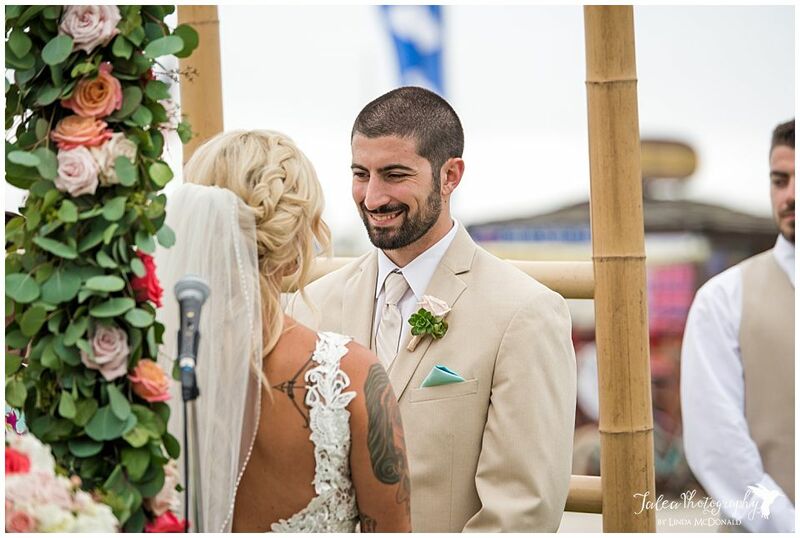 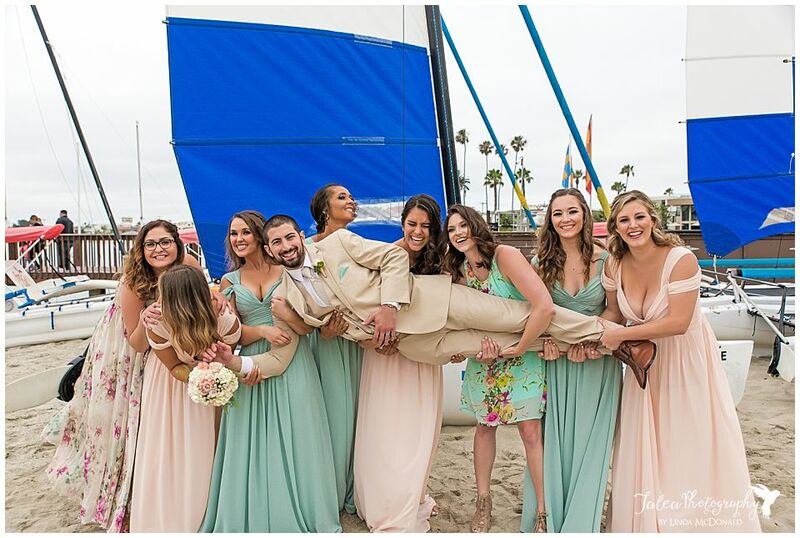 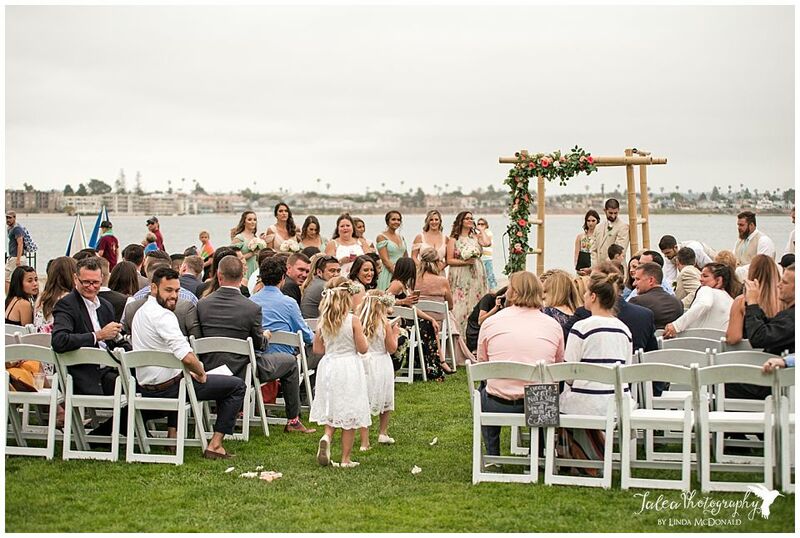 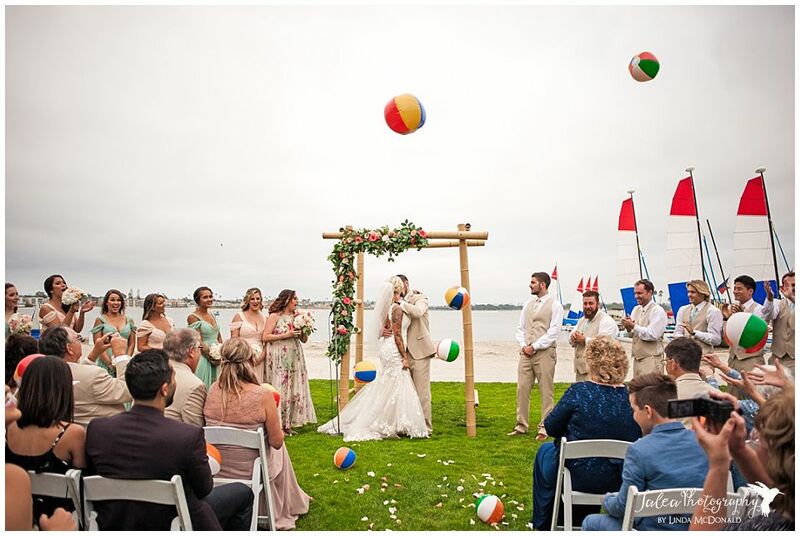 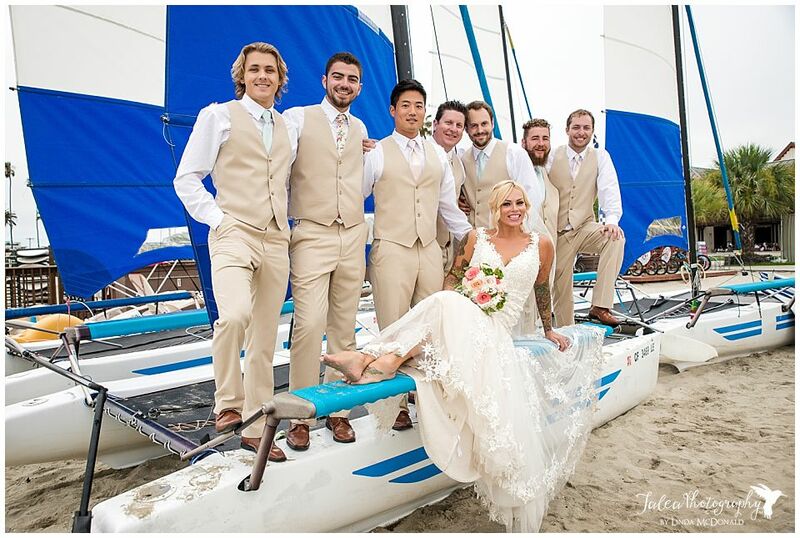 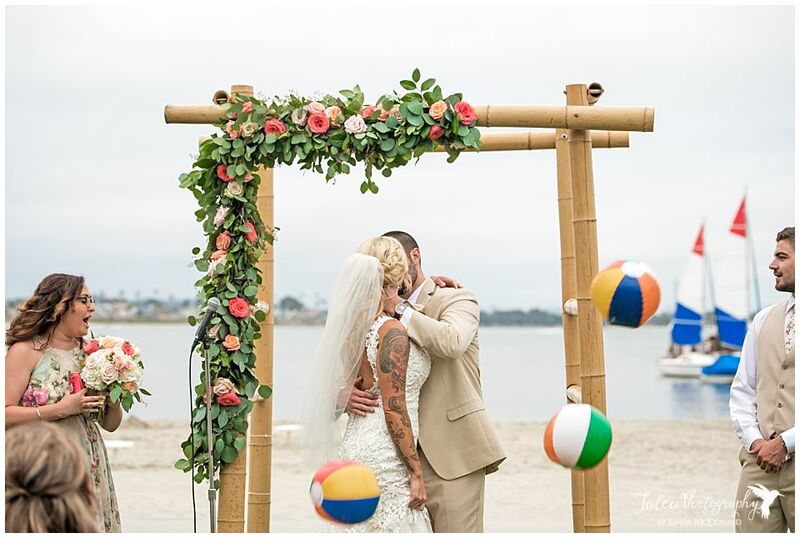 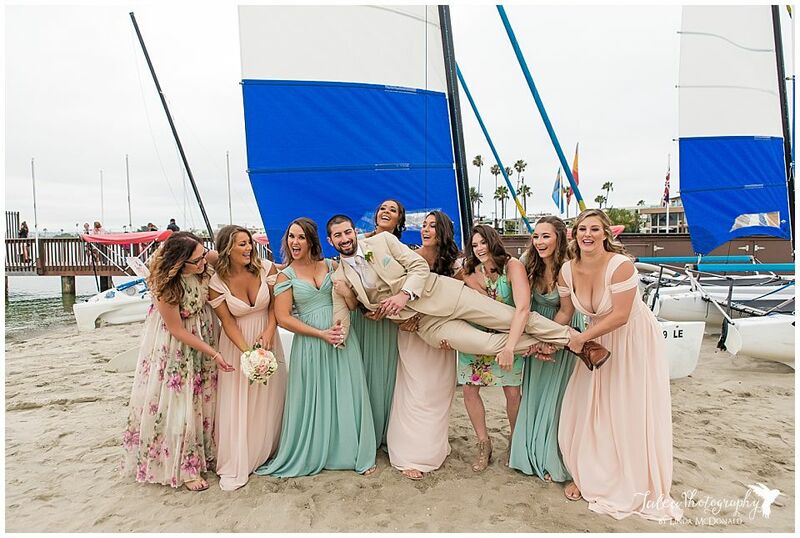 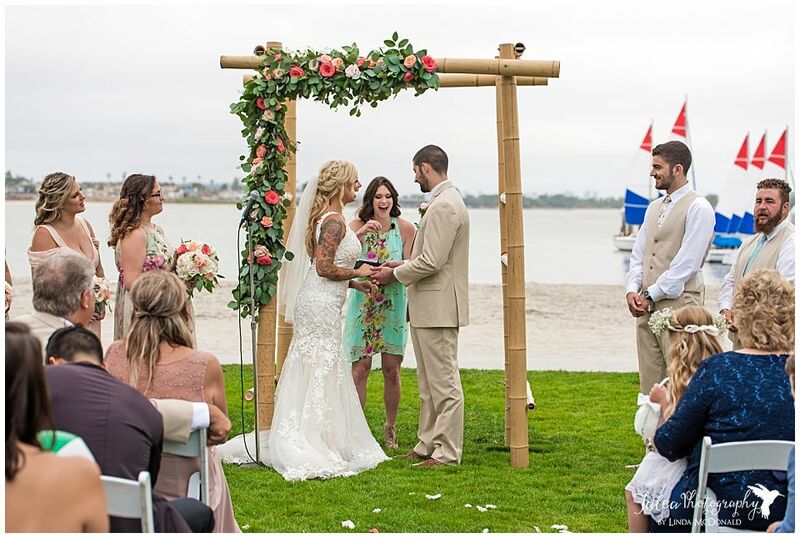 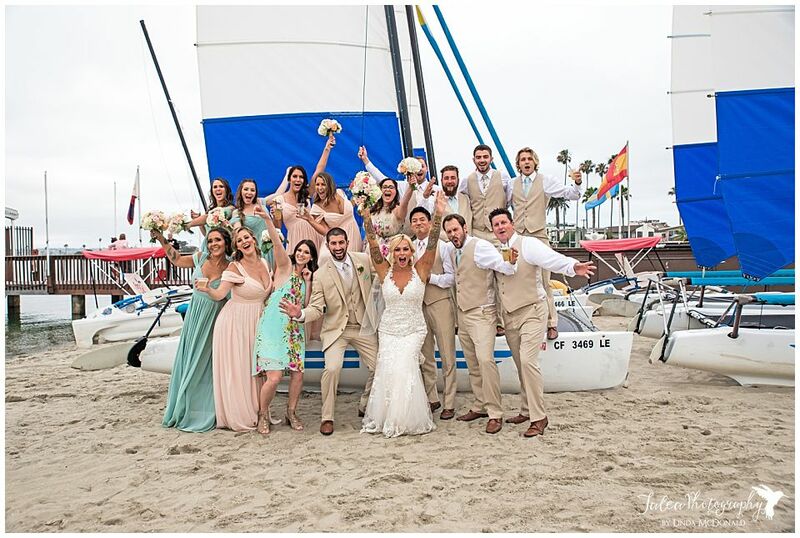 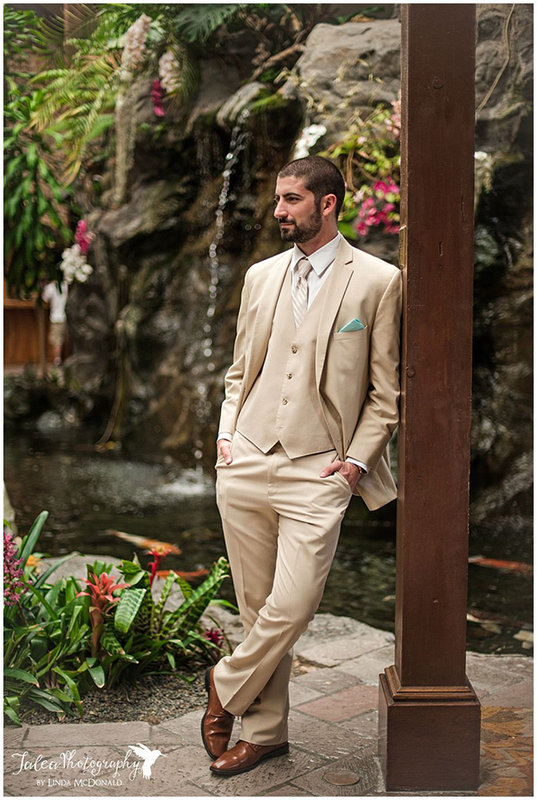 The Catamaran Resort in San Diego is an ideal location for anyone wanting a casual beachfront wedding with a Polynesian theme. 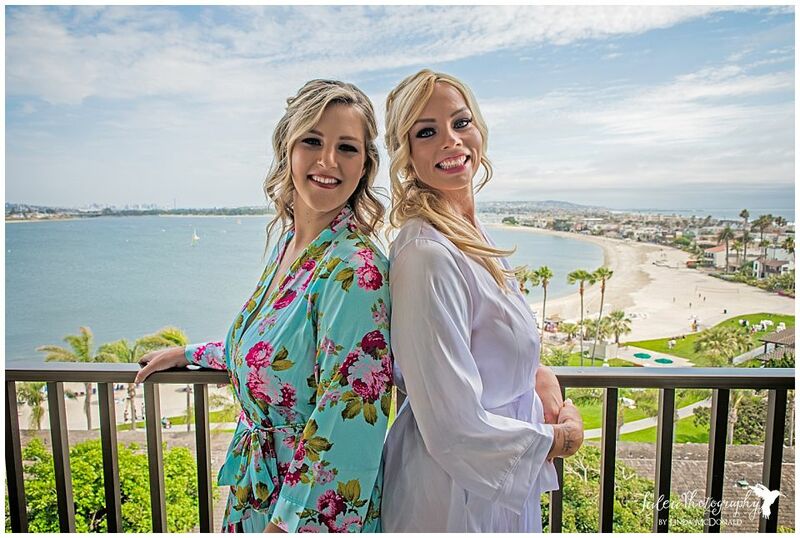 The tower rooms have an incredible view of the bay.